HomeCulture & LifestyleWho wants to be a Millionaire? It is a new television game show that offers cash prizes to contestants who can answer a series of questions correctly. The show originated in the United Kingdom and has now spread to all corners of the world, to countries like the US, Vietnam and even Peru. 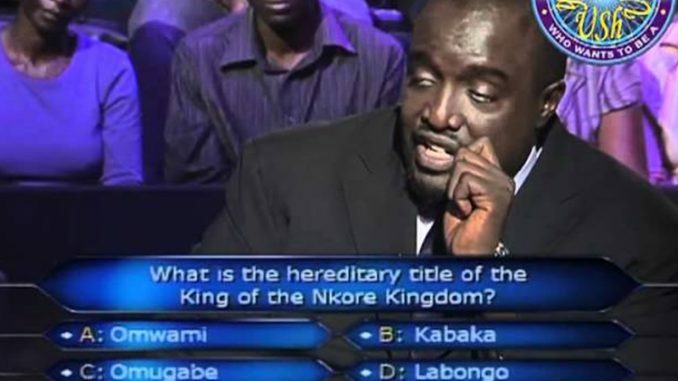 January 2011 saw ‘Who Wants to Be a Millionaire?’ coming to our very own Uganda, with screening rights going to NTV and hosted by popular radio talk show host Alan Kasujja. All one has to do to earn 25 million shillings in no time at all is to answer 15 multiple choice questions correctly, which as always, will increase in levels of difficulty as one goes along. The first five questions will garner you 100,000 for every question you get right. Participants usually walk away with 500,00 regardless because the questions are designed to ensure that a baby could answer them in it’s sleep. If you want to be a millionaire or perhaps a half-millionaire, it wouldn’t be a bad idea to join the line vying for the money. There’s only one catch. You must have a UTL line and send an sms with your name to the number 185. UTL subscribers can finally live each day in hope!